Rory McIlroy says that Ryder Cup captain Thomas Bjorn's leadership has been validated after all 12 members of the team contributed to their 17.5 to 10.5 win. McIlroy, who lost his singles game today to Justin Thomas, said: "I think that the leadership's been great. I think the players, the rookies have been phenomenal. "You know, we've all just stuck to our jobs and we've all - one of the great things about today is we all won The Ryder Cup points. "Jon Rahm got a point and Thorbjørn [Olesen] got a point and I'm delighted for them, it means that all 12. It validates what Thomas has wanted to do. It validates who made the team, the picks he made. "It's a culmination of two years of very hard work and I'm delighted for everyone that's a part of it. "He's been incredible. Just over the past two years, he's been great. He's been in constant contact with all the guys that were either going to be on the team or on the periphery, and you know, he's built up a real rapport within the squad. "Not just with the players and himself but within the players, as well. "I'll tell you that. 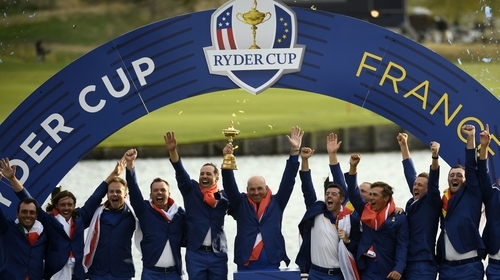 It's been fantastic to be a part of and one of the great things about Ryder Cups is you forge friendships that last a lifetime. I think a few of those friendships have been forged this week."